In 2010, we began including a Thurgood Marshall Fund flyer in Senior packets at J.E.B. Stuart High School to improve applications and participation. Over the last ten years, the Thurgood Marshall Fund has received only five to fifteen scholarship applications per year. In a review of the information about the Thurgood Marshall Fund available to seniors, it was determined that the scholarship needed to launch an annual campaign to better inform students. 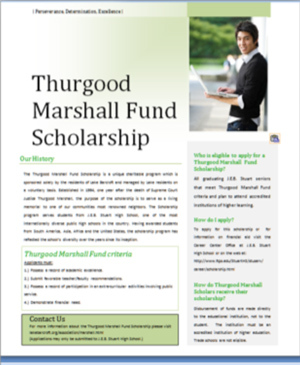 In the flyer, we explain the selection criteria to give students a better idea about their qualifications when deciding whether to submit an application to the Thurgood Marshall Fund. Possess a record of academic excellence. Possess a record of participation in an extra-curricular activities involving public service. Submit a 250 word essay on Justice Marshall. In 2011, we revised the directions for the required essay to better explain that the purpose of the essay is to remember the life of Justice Marshall and celebrate the impact that his work has had on our society. As with all initiatives, the Thurgood Marshall Fund will continually evaluate and refine its outreach to Seniors at J.E.B. Stuart High School.